Chicago—Potter and Potter's Freakatorium: The Collection of Johnny Fox auction caught the attention of enthusiasts from every corner of the globe and delivered exceptional results - surpassing its high pre-sale estimate by more than 50%! After the hammer fell for the last time, 74 lots realized between $1,000-2,499; 36 lots made between $2,500-6,999; and nine lots broke the $7,000 barrier. Prices noted include the company's 20% buyer's premium. 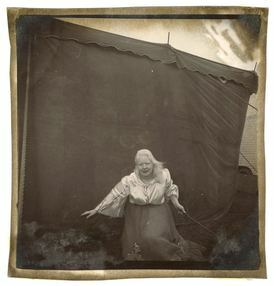 Getting right to the point, lot #94, a collection of two c. 1970 silver prints of sword swallower Lady Sandra Reed was the top lot in the sale. Estimated at $1,000-1,500, they realized $28,800. The photos are attributed to photographer Diane Arbus (1923-1971) and included one shot of the performer kneeling and the second with a sword raised in preparation for the attempt. The prints were believed to be unique, and were accompanied by a note of provenance by Reed. Research shows that this is a record price for the most expensive sideshow item sold at public auction. Other ephemera highlights from the sale included lot #198, an 1880s Wild West Beacon Park season program listing William Cody as Buffalo Bill and Dr. W.F. Carver as an evil spirit in a wild west show, and lot #428, an American Circus broadside from 1846 advertising various equine acts. Each was estimated at $200-300 and made $2,640 - almost 9 times their high estimate! Big top and sideshow banners also headlined this auction both in size and sales. Lot #15, c. 1945 Freaks. Alive. canvas sideshow banner was estimated at $3,000-5,000 and realized $11,400. This enormous masterpiece featured sideshow attractions such as the alligator skin lady, a conehead, and a sword swallower. Lot #12, a Magic. Alive. sideshow banner painted with a half-length portrait of a magician in white tie and tails producing cards, birds, and bats soared to $7,800. Both of these were painted by the Snap Wyatt studios in the 1940s. And lot #35, a c. 2000 Frierson Studios miniature sideshow banner featuring a two headed calf generated 30 bids and $2,125. Circus posters were well represented in this off the wall sale, with those picturing elephants really capturing the eye - and wallets - of collectors. Lot #338, a c. 1882 linen backed color litho depicting Jumbo giving kids rides on his back was estimated at $3,000-5,000 and delivered $10,200. Lot #338, a Barnum and Bailey Greatest Show on Earth color litho from 1913 illustrated with an elephant baseball team was a home run at $7,800. And lot #340, a John B. Doris’ Great Inter-Ocean Museum, Menagerie & Circus color lithograph from c. 1883 featuring a flamingo, elephant, lion, hawk, and alligator made $7,800. Fox’s Freakatorium displayed over 1,000 oddities within a 500 square foot venue. These included items related to circus sideshows, historical objets d'art, stage illusions, photographs, and tabloid style ephemera. Lot #245, a brass “Champion Strong Woman of the World “ trophy belt presented to Minerva (Josephine Blatt., c. 1869-1923) by The Police Gazette in 1893 New York was estimated at $3,000-5,000 and flexed its muscles at $7,800. Lot #495, a 19th century glass sided gothic revival cast iron terrarium/aquarium generated 31 bids and $2,500. Lot #516, a German, mid-sixteenth century casket style strongbox with an intricate locking mechanism traded hands at $4,560. Collectors said yes to lot #283, a collection of 28 different sideshow giants’ souvenir rings. Estimated at $400-600, this happy handful sold for $3,840. And there’s no bones about it - Freakatorium items featuring human or animal body elements were also quite popular. Lot #295, an early 20th century South American shrunken head made $7,500, and lot #603, a c. 1920s bone sculpture of a Chinese garden blossomed at $1,440. Finally, It is interesting to note that bidders gave a high five to items with provenance to Tom Thumb. Lot #247, a boot reportedly owned by Thumb, sold for $5,040. Lot #249, Thumb’s Victorian-era walking stick with an ornate gold-filled handle made $4,560. Lot #247, his dark brown satin and dotted waistcoat buttoned things up at $3,840. And it was lights out for lot #251, a Tom and Lavinia Thumb-owned overnight trunk and its contents. This treasure trove included Thumb clothing, accessories, memorabilia, and ephemera. It sold for $18,000 on its $1,500-2,000 estimate. According to Gabe Fajuri, President at Potter & Potter Auctions, “The stars aligned for this sale. The combination of a great story, great (and rare) material, and a loud and constant buzz online and in the collecting communities that this auction was of interest to set us up to hit a real home run. Bidding was fast and furious, coming from private collectors, Johnny Fox's personal friends, public institutions, and lovers of the unusual alike." Potter & Potter, founded in 2007, is a Chicago area auction house specializing in paper Americana, vintage advertising, rare books, playing cards, gambling memorabilia, posters, fine prints, vintage toys, and magicana - antiques and collectibles related to magic and magicians. The company's next sale, featuring hundreds of important vintage travel posters, will be held on December 1, 2018. For more information, please see www.potterauctions.com. Follow us on Facebook (potterandpotterauctions), Twitter (PnPAuctions), and Instagram (potterauctions).